From CNY to NYC - Family Times is an award-winning magazine with staff-written news, feature stories and artwork that inform and inspire Central New York parents and their children. The Big Apple. New York City. It’s so big and imposing and filled with possibilities. It’s hard to winnow down what to do and where to go. Yet we are so close, many parents feel the desire to take their kids for a visit. Here are some ideas for how parents and their children of all ages have tackled the Big Apple and returned wanting to go back for more. An important disclaimer: You can’t do it all. New York is one of the greatest cities in the world and a weekend there will not do it justice. So just think of it as a lifetime project. Little by little through the years you and your kids will get to know it and feel more comfortable there every time. So, for starters, plan to leave on a Friday. Before you go, consider whether purchasing the City Pass admissions ticket or a similar multi-attraction pass will save your family money, depending on how many attractions you’re planning to visit during one stay. Sometimes cheap plane tickets can be found from Syracuse to one of the NYC airports, but don’t count on it. 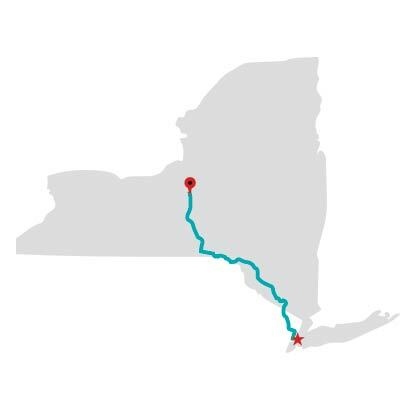 By car, it’s about a five-hour drive from Syracuse. One must feel strong enough to maneuver in the big-city traffic and wealthy enough to pay the hotel parking fee, which can be $30 or more per night. Some like the train. From Syracuse, this option also takes about five hours and can be relaxing or tormenting depending on your children. You and the kids will be contained within a few seats but can get up and walk to the bathrooms and dining car for snacks. A little pricier than the bus, Amtrak will deposit your family at Penn Station near Seventh Avenue and 34th Street. Finally, many parents choose the New Jersey route. Huh? That’s right. Drive to New Jersey to spend the weekend in NYC. Many motels offer relatively low room rates. Walk or take a shuttle bus from the motel to the nearest train station and take a Path Train into “the city.” This can be fun and save a bundle of bucks. If the motel offers a pool, that can be a nice treat at the end of a busy day. These motels usually offer another benefit: free parking. So once you’re there, try to relax. I recommend taking Friday night to rest up after the trip. If you’re in the city, go out for dinner and back to the hotel for early bedtime. If you’re in Jersey, take a dip in the motel pool, get some dinner and head to bed. Start with the dinosaurs, whales, bugs and sky. 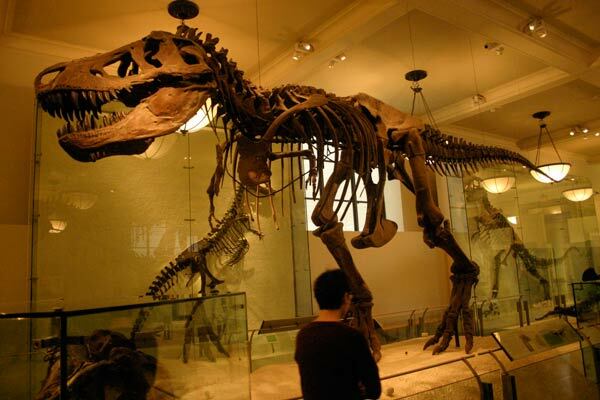 That means heading to the American Museum of Natural History, located on the Upper West Side of Manhattan at 79th Street and Central Park West. Tickets are $22 for adults and $12.50 for children ages 2 to 12. Plan to spend one to three hours there depending on the interest and attention span of your children. Take some time before visiting to study the museum’s “Plan Your Visit” page on its website to determine where to take your children first. Luckily, snacks are easy to find in New York. Sit down in the museum cafeteria or get a big pretzel from a street vendor. Try an ice cream store or simply pause with a juice bag. It’s time to tour the Big Apple. After walking the museum’s halls, enjoy the outdoor scenery from a guided tour bus. Double-decker buses thrill kids of all ages and riding one can provide a relatively quick look at all New York City offers. Jump off or grab lunch at the end of an hour’s ride. Several companies offer this service. 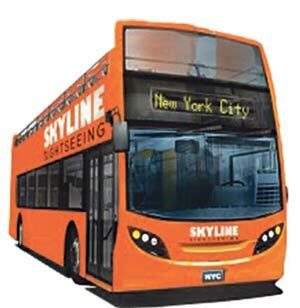 Skyline Sightseeing is one that offers hop-on, hop-off rides for one or more days starting at $22 a person if purchased online. By early afternoon the kids probably will be ready to run around, so head to the Central Park Zoo, which is located off Fifth Avenue at 64th Street. Buy tickets online before you go to save 10 percent. The penguins delight as do the sea lions, bird exhibits and reptiles in the main zoo. (Look up their daily feeding times online as well.) Then move on to the Tisch Children’s Zoo, which offers some interactive play areas for children itching to get involved. Buy the “Total Experience” tickets and the family can relax in the 4D movie theater. Check the zoo’s website for the featured movie, with show times every 15 minutes. This could be a good place for babies to nap and others to cool off. The zoo closes at 5:30 p.m. on weekends. After all that excitement, I’d be ready for a nap, dinner or a swim back at the motel if possible. Or, if older children are along, head to Broadway for a show. Advance ticket sales are the best way to go if you don’t have time or patience to stand in the half-price TKTS line in Times Square, the South Street Seaport or Brooklyn earlier in the day. Full-price tickets can be very expensive, but each Broadway show is a once-in-a-lifetime experience. Some sales can be found: Disney credit card holders receive discounted ticket offers at times for Disney productions; sign up for a theater newsletter that offers sales; or just try your luck with prices for off-peak shows during the week. Start the day at Battery Park in the south end of Manhattan Island to catch a free ride on the Staten Island Ferry. 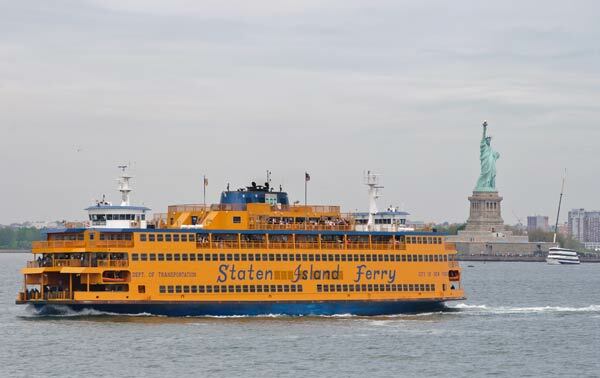 This iconic ferry leaves every half-hour and gives a 25-minute ride past the Statue of Liberty and Ellis Island, where many immigrants landed upon arriving in the United States a century ago. The working ferry provides transportation to more than 60,000 passengers a day and is a secret tourist spot for real New Yorkers. Upon landing at the St. George Terminal in Staten Island, disembark from the ferry and board again for the return trip. When back in Manhattan, notice the 28 granite benches designed to look like Native American canoes in the waiting areas. If you want to postpone the Manhattan cruise to dusk, consider a twilight cruise around the Statue of Liberty. After the ferry, let the kids stretch in Battery Park, where they may encounter street musicians, artists and other entertainers. Be prepared for beggars as well; decide how you will explain these folks to your children and whether you will give them money, say hello, etc. Of course, this is a discussion you may have already had concerning street people in Central New York, but one is likely to see more in NYC. Depending on the age of your children, the Empire State Building or the 9/11 Memorial may be next on the agenda. The 9/11 Memorial is free for visitors, although the museum requires paid admission starting at $15 for children ages 7 and up and $24 for adults. The 9/11 Memorial is located at the World Trade Center location, which can be reached easily by subway or bus. Names of each person who died in that terrorist attack as well as the 1993 bombing there are inscribed around the two memorial pools. The Empire State Building is located north at 34th Street and Fifth Avenue and is open from 8 a.m. to 2 a.m. daily. An elevator ride to the main observation deck on the 86th floor costs $29 for adults, $23 for children ages 6 to 12. Add a trip to the deck on the 102nd floor of this skyscraper for an additional $17. As a resident of New York, a visit to the Empire State Building should be required sightseeing. When back on the ground, walk or ride about 13 blocks north on Fifth Avenue to Rockefeller Center. In cold weather, the open-air skating rink greets visitors in front of the building; tables with umbrellas line the rink in warm weather, beckoning visitors for food and drink (not cheap but a fun atmosphere). This is a good location to get in shopping, snacking or a full meal. Take time to view the art deco murals and sculpture produced during the Depression and lining the walls and corridors of the entire complex inside and out. Some visitors prefer the observation deck at the Top of the Rock on the 67th, 69th and 70th floors from which one can view the Empire State Building. Others head to the NBC Television Studio Tour, which unfortunately is closed for renovations until much later this year. Before leaving this area, view the expansively decorated windows of the flagship Saks Fifth Avenue store or check out its elaborate first floor—or more, if you and your credit cards dare. Across the street is the historic St. Patrick’s Cathedral, where visitors may enter and tour the Roman Catholic church, which officially opened in 1879. If you pause to sit in a pew, ask the children to find and count the red cardinals’ hats hanging from the ceiling. Next, one could head north to the Metropolitan Museum of Art or a bit south to the frivolity of Times Square. Times Square, located from 42nd Street to 47th Street bounded by Broadway and Seventh Avenue, features the lights of theater marquees, the sounds of traffic, plenty of candy and toys. 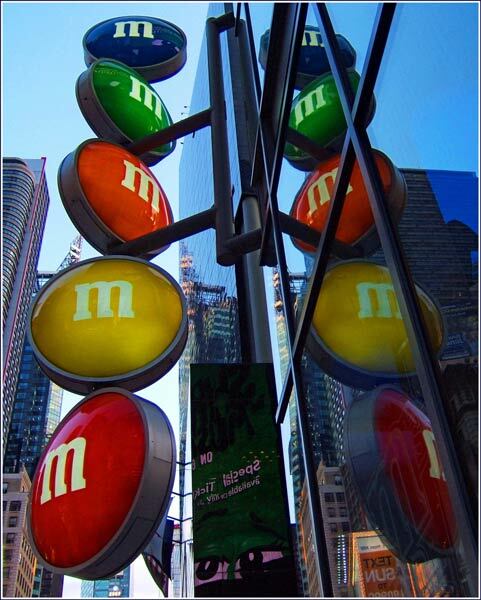 One can’t miss the giant M&M’s World store with its two-story wall of colorful M&Ms candies. It’s open daily from 8 a.m. to midnight. For a customized souvenir, try the “personalized printer,” which will allow an image or words to be designed on your M&Ms in just about two minutes. With candy in hand, head over to the Toys R Us flagship store at 44th Street. Take a ride on the 60-foot tall indoor Ferris wheel, wander through the life-size Barbie dollhouse and listen for the roar of the 20-foot animatronic T-Rex dinosaur, among other exhibits, er, toy areas. Tours of the store are available with advance reservations. If children have saved their souvenir money until this point in the trip, this toy store experience may go pretty well. If you’re ready for an expensive snack, stop into the Cake Boss Café, located at 625 Eighth Ave. near Times Square. Open from 7 a.m. to midnight, this new hot spot allows fans of the TV show Cake Boss, and its master baker Buddy Valastro, to try his pastries without traveling to one of his bakeries in New Jersey. Enough extravagance, it’s time to take in one more museum: the Metropolitan Museum of Art, located on Fifth Avenue at 71st Street. Children will be delighted to see the knights’ shining armor, artifacts from ancient times and some Egyptian mummies among the thousands of items collected there. Admission fees are listed as suggested donations and the museum is open daily from 10 a.m. to 5:30 p.m., and until 8 p.m. on Fridays and Saturdays. (This museum is another good option for a Saturday-night activity.) Don’t hesitate to sit down and rest on the museum’s steps that face Fifth Avenue. It’s likely street musicians or magicians will entertain your family there. OK, with sugar purchased and a souvenir in the bag, it should be time to head home. If you’re staying until Monday, head down to 200 Fifth Avenue to find your favorite food in former “Iron Chef” Mario Batali’s Eataly. This food complex boasts seven sit-down restaurants and several stands for take-out food, such as sandwiches and desserts. The latest addition is a Nutella bar, which features the chocolate-hazelnut spread in pastries. Reasonably priced pizza and other Italian dishes can be found at one or two of the restaurants; others feature high-end delicacies that may be too much for a child’s palate or allowance. Be careful about staying until Monday, however. By now the children may have figured out you’ve skipped other attractions, such as a hansom cab—or horse-drawn carriage ride—through Central Park; lunch and shopping at the American Girl store; and a visit to the South Street Seaport. Not to mention at least 15 other museums, famous stores and more. Let the kids plan—and pay for—the next visit to NYC. From $32 adult and $22 child for one-day pass booked online. TKTS tdf.org. Times Square, Father Duffy Square, Broadway and 47th Street; Downtown Brooklyn: In 1 MetroTech Center at the corner of Jay Street and Myrtle Avenue Promenade; South Street Seaport: Corner of Front and John streets. 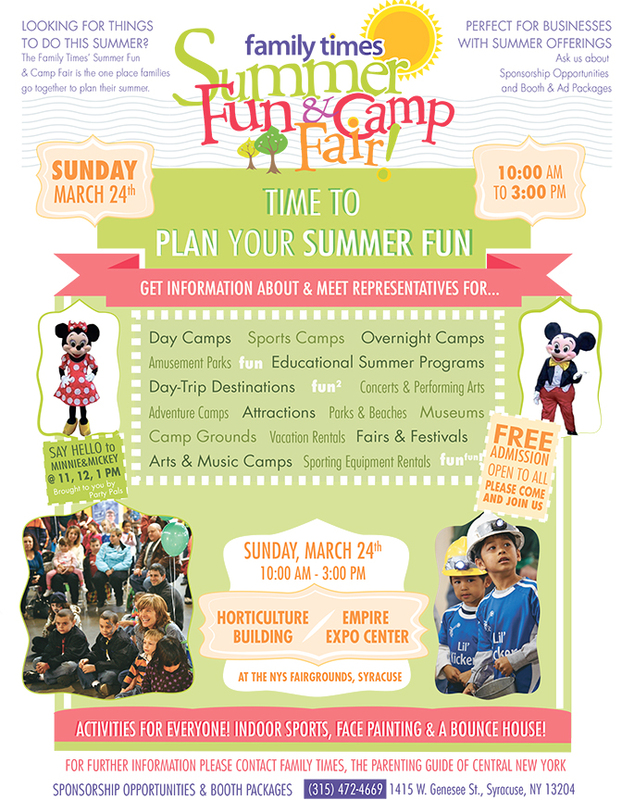 Suggested admission: $22, adults; $12.50, ages 2-12. Pay admission of your choice when buying tickets in person; full price when buying tickets online. $18 adult and $13 child admission to zoo, Tisch children’s zoo and 4D movie. Save 10 percent by buying online. Free. At least every 30 minutes around the clock. Memorial admission is free. Museum admission is $24, adult; $15, ages 7-17. Main deck only: $29, adult; $23, ages 6-12. Buy tickets online and skip ticket line on ground. Observation deck tickets: $29, adult; $18, ages 6-12. I really enjoyed your article “From CNY to NYC” (July 2014). It contained a minor error, which actually gives rise to the addition of another attraction. The Frick Collection art museum (and not the Metropolitan Museum of Art) is located at Fifth Avenue and 70th Street. Along with stunning exhibits, the mansion itself is worth a visit. One’s imagination turns back to early New York City, when such mansions were prolific in this residential area. Most mansions have fallen to accommodate tall, posh residential and academic buildings. See more at: www.frick.org. A short, beautiful walk northward will take you to the Metropolitan Museum of Art, located at Fifth and 82nd Street. One of my fondest memories of “The Met” is a trip I made with two favorite 12-year-olds. I had to bribe them into going to the museum with the promise of a trip to Old Navy’s flagship store. Upon arrival, we went to the temporary exhibit of famous rock stars’ costumes. I couldn’t get them to leave! We saw the Beatles’ Sgt. Pepper Lonely Hearts Club Band outfits, Debbie Harry’s razor blade dress, Elvis’ many suits and more. The exhibit was sponsored by Tommy Hilfiger. All in all, this was a great example of never knowing what surprises await you in NYC.